I was in Las Vegas and caught the Vegas entertainment The Blue Man Group with my pal Lindsay. What a hoot. Totally original. Very funny. Audience participation…. big time! They are some seriously blue entertiners. And tons of humor and laughter. To be honest, not my favorite show. But I still enjoyed it a great deal and was glad to see these entertainers at work. Great stuff. 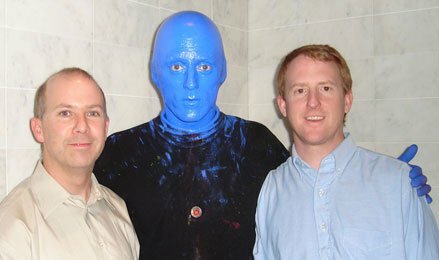 I don’t know about you, but anyone who poses for a picture with a guy with a blue head have to be some cool dudes. Seriously, are they rock stars or something? IBM Smells funny? What is a mastermind group?